Lewis Hamilton made a mockery of his claim that Ferrari would be half-a-second quicker at the Australian Grand Prix by easily clocking the fastest times in the season's opening practice sessions Friday. 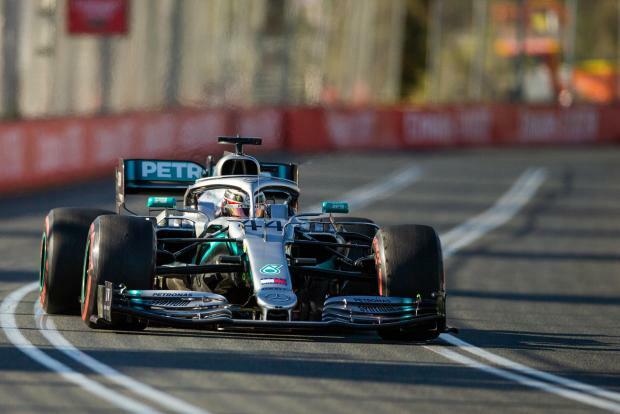 The Briton led a Mercedes one-two in the second session as he powered round the Albert Park circuit under clear skies with a best of one minute 22.600 seconds among his 33 laps. It bettered his pace-setting 1:23.599 in the opening practice as he kickstarted his bid for a sixth world title. Valtteri Bottas was second (1:22.648) with Red Bull's Max Verstappen third (1:23.400), marginally ahead of impressive new teammate Pierre Gasly, who was promoted this year from Toro Rosso. Sebastian Vettel, who has won in Melbourne for the past two years, could only manage fifth, nearly a second adrift of arch-rival Hamilton, while Ferrari partner Charles Leclerc struggled to ninth, straddling the kerb and spinning as he pushed hard late in the day. Vettel slid onto the grass at turn one early in the afternoon run. "Check the car in turns one and four. Feels quite odd... Seems to be something wrong. Box," he said on the team radio. He recovered but later told the team his car was "still a bit wobbly". The man Leclerc replaced at Ferrari, Finnish former world champion Kimi Raikkonen, pushed his Alfa Romeo -- formerly Sauber -- into sixth. The Renaults of Niko Hulkenberg and Daniel Ricciardo were sixth and seventh respectively. Hamilton is gunning for a third world crown in a row to close in on Michael Schumacher's all-time record of seven. Much had been made of his insistence after pre-season testing in Barcelona that Ferrari were up to half-a-second faster, but he quickly put that fallacy to bed. On soft tyres, the 34-year-old, who has triumphed twice in Melbourne, in 2008 and 2015, was always the man to catch as he angles for an 84th pole position. Toro Rosso new boy Alexander Albon had a troubled introduction to Formula One, losing his front wing in a crash at turn two in the first practice. His car was repaired and ready for session two but he slid onto the gravel again, managing to stay away from the wall, and then skidded onto the grass. "Oh my God, my finger got stuck on the headrest," he said on the team radio in explaining the gravel run. It was also a frustrating day for Poland's Robert Kubica, in his first Formula One drive since his right arm was partially severed in a horror rallying accident eight years ago. His fastest time of 1:26.655 for Williams was the slowest on a day marred by the sudden death on Thursday of long-serving and well-respected Formula One race director Charlie Whiting. FIA chief Jean Todt held a minute's silence to mark his passing in a press conference, with deputy race director Michael Masi fulfilling Whiting's duties in Melbourne.